Our key dip gauge is cheap and easy to use. More sophisticated gauges available for the professional. If your front rail, or center rail, felt punchings are eaten away or missing, we have all sizes. While you are at it, order the paper washers for the center rail and the front rail. The key "dip" is not your uncle who plays chopsticks. It is the amount of drop of the key when you push it down (See diagram). It should be three eighths of an inch minimum, but no more than a half inch. If you ordered Key Dip Gauge from the Online Catalogue, use the wooden gauge by laying it on a white natural key you want to check, as shown in the diagram. The top of the wooden gauge should be level with the two keys on either side of it if the key "dip" or drop is right. To check the sharps, lay a ruler on the tops of the sharps. Push down the one in question, and measure the amount of key dip with the wooden gauge or with another ruler. If the key drop is a lot more than a three eighths of an inch, and if the hammers are hitting the wires and trying to stay against the wires, mice have made a nest with the felts under the key fronts, or moths have feasted on filet of green felt washer. The missing felt allows the key to drop too far. Open the piano, and take all the keys out. You can order a set of front felt bushings from my Online Catalogue. If you have purchased a set of the felt washers from me, throw all of the old ones away. Be careful not to pull off the paper washers under the green felt washers. These are there to level the keys to each other. Put one new green felt washer on each pin, and reassemble the piano. You may find that this will correct the key drop completely since the keys will be back to their original condition. If you have more than a half inch drop, and if the hammers jam against the wire after you strike a note, add a paper washer to each front key lever pin for every note, and so on, until you get it right. (Again, you can accomplish the same results by removing a paper washer from the center pin under the key lever.) This can be fine tuned by adding and taking away paper washers, which you should do in order to level the keys cosmetically (See next section). It is important to level the keys while setting the key dip. One affects the other. If you add or remove shims at the center pin of the key lever, you must be careful not to raise the key lever too high, or you will have the key levers resting hard against the under side of the fall board when you reassemble the piano. Also, you will find that only a very thin paper washer is needed to make a lot of difference. If you used the Online Catalogue green felt washers, and there is too much or too little key drop, you can add or take away by adding or removing paper washers. The paper washer assortment can be ordered from the Online Catalogue also. You will get an assortment of several thicknesses. If only one or two keys drop too far down, just replace the felt under those keys. I have found though, that when two or three keys have dropped too far because of felts being eaten away, the other felt washers are in lousy condition and should all be replaced. If your problem never was that moths or mice ate your felts washers, you ought to follow a different approach to correcting key drop adjustment. You should adjust the key drop by adding or removing paper washers under the center rail bushings only. Look at the Diagram page to locate the center rail felts. These are the smaller bushings on the pins where the key rocks as you press it down. It this case, and if the felts are not eaten up, you have to rethink the process. If you have too little key drop, you will add paper shims to the pin at the center rail felt washer. If you have too much key drop, remove paper shims. As mentioned above, a very thin paper shim will make a lot of difference, so be conservative. 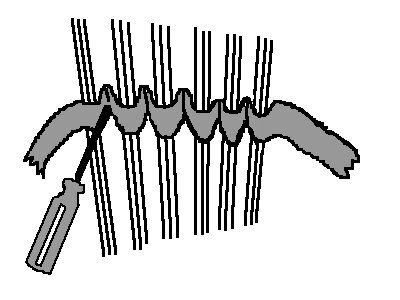 You may have to Adjust the action after this process if you can see that the hammers have lifted off of the hammer rest, or if there is "lost motion" in the action. Go on to the next section now to level the keys if they need it. This happens when gourmet moths eat only the smaller white felts under the center of the keys (See Diagram page). Again, if you want a really new looking key board, replace ALL of the felt bushings at the key lever center pin and at the front pin. Don't try to mix and match with the old felt bushing and the new. However; if only one or two keys have dropped, and the rest look level, just replace the felt under those keys. If, after you are all done, the keys are not level, go to Key Leveling, the next section. All principles above also apply to the grand piano. The problem is, the action must be removed (Chapter Five), and the hammer rail and action must be removed. First, take out the eight or ten screws holding the action onto the key bed. This is not really as fearful as it may seem. Just work carefully and don't hurry. Set the hammer rail and action assembly aside where it cannot be banged of bumped. Second, you must find some way to hold the back end of the key levers down. We can provide a set of weights for you if you wish to buy them. SEND MAIL if you want to make the investment. You may also improvise by finding weights to affix somehow to the back end of the keys. Once this is done, follow the same principles found above for uprights. Use the paper shim, which you can buy from our Online Catalog, to set the key dip.